Danielle holds the honor of not only being new to GoRuck – but also being new to the NE Spahtens. In an odd twist of fate, she ended up being solo last weekend, and landed on Bravo Team. Right after Christmas this year I started registering for events for 2013. After a Resolution Run with Becka we stood at the TNT table where I was on the fence to sign up for this half marathon. I also was on the fence about signing up for a GoruckChallenge. So that day we made a deal that I would do the Half and she would do the Goruck. We started training for the Half in mid January and on my non-running days I used my ruck and 6 bricks to get used to the weight in the bag on my shoulders. The Goruck being in March meant it was before the Half and I would start using the bag on some of my shorter runs. Unfortunately Becka was injured and in hopes to get her better for the Half transferred her Goruck entry until a later time. So March 16th, 0100 rolled around a lot quicker than I thought it would. The whole week I was sort of a mental mess. I knew I was going to test my physical abilities but for some reason getting my head into the game was a lot harder than getting my body to be stronger. Now that it was just me heading into the Goruck I was nervous because it is easier to jump into something with a friend but I knew it was a team challenge so I got in my car and headed to Boston. Being in the right place at the right time, I got into Boston and started chatting with some people from the NE Spahtens team that I had joined their facebook group to hopefully join in on some 5k OCR or something. Well at 0100 we got into our lines and I happened to fall in with this amazing team. 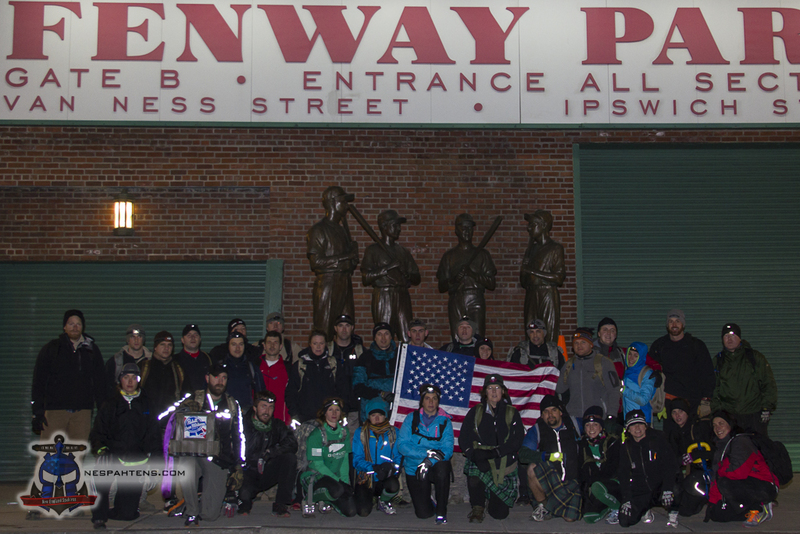 Our first mission was to get to Fenway Park and to do so silently. As the Cadre noticed us not working together and being not so quiet people were being “wounded” and we had to carry them to our destination. With no watches and it being the early morning, we had no idea what time it was or how long it took us to get to Fenway. But we made it but failed our mission because we were too slow. PT it was, and in honor of the Red Sox and the fact that Cadre Chris missed both World Series games being deployed we did pushups, and flutter kicks in cadence in reps of 86. With time to refuel and change out team leaders our next mission was to get 4 giant cardboard bundles from Fenway to Faneuil Hall. Cadre Chris told us how those 4 giant bundles were pieces to a nuclear weapon and we needed to get it to its destination. If i could remember the real life story I would tell it but it was 4am maybe at this point and well I can’t remember it other than in the soldiers bundles it was 3 pieces- 2 parts nuclear weapon, 1 part handle of whiskey as it was basically a suicide mission. So off we went. Compressed cardboard bundles, I will never look at them the same. They were heavy and awkward and needed at least 4 people to carry them. The words “move faster” were uttered many times as we headed to Faneuil Hall. As we approached the Swan Boat area we were told the bridge was lined with IED and that we had to go around. So into the muck we went. So what happens when a bundle falls apart and you leave part of your team behind? PT and again we were honoring the Red Sox in cadence for 86 pushup then 86 flutter kicks before getting out of the Boston Common. I can honestly say that with everything that was going on with this mission it was a blur getting to Faneuil Hall and once we set those 4ish bundles down to end the mission and find them their final resting place in a dumpster. But Boston PD had a better plan for us. Apparently they come out of nowhere on a crowd of 30 “weirdoes” and giving us our marching orders to leave their property. So onward up to Haymarket we went trying to find these bundles a home and between random trash bins and recycling bins (and the side of the street) they did. Now it was on to Bunker Hill like our hair was on fire and once we arrived there it was time to come together with buddy carries. Now I am not small, I am on my way to getting to my goal weight and well no lady was the same height or weight I was. So I met Steven, we were not the same size or height but we were matched up. Mission was to buddy carry each other 50/50 to the USS Constitution. The phrase “If you aren’t cheating, you aren’t trying” was mentioned to us and well we took advantage of that. Steven did carry me for a bit but then as we tried to switch and I give him a piggyback ride, we went down like a ton of bricks. So we took rucks, we took team weights, a road cone, and the team flag and off we went trying to keep the team in somewhat order bringing up the rear. Longest break we had was at the US Constitution and after some food, water, and bathroom break it was time to get to Harvard Stadium, like our hair was on fire. As we weren’t coming together as a team we were forced to come together. We lost strap privelages at this point and could only carry our rucks but 1 handle, then had to carry them as a team by holding 1 strap each with the person in front and behind us. Making our way through Charlestown we were working as a team in walking/fast shuffle in cadence. Options: Get in the water waist deep to ear 1 strap back or do (you guessed it) 86 pull-ups as a team on a nearby playground. We opted for the pull-ups and came about halfway to pulling that off. So we got 1 strap back. Not it was double time like our hair was on fire to Harvard. The Bar rule: Get a bar to serve you a drink for free and we get a break with no ruck and we get the beer. Mission accepted. Mission failed as Cambridge at whatever time it was in the morning had no bar open to even try to get a beverage. Onward to some railroad tracks, Cadre Chris happened to find 2 railway ties hanging out which needed to get to their new home at MIT. So we separated into 2 teams by height and off we went. Yet again hearing “Move Faster” as we went down Mass Ave heading to MIT. The final stretch (but we didn’t know that at the time) was to get back to Bostom Common say it with me: LIKE OUR HAIR WAS ON FIRE. At this point we were starting to get it, keeping our formation decent, changing the team weights between us and keeping them at the front. Keeping the group together and navigating to the common. Then causalities stuck, and we were slowed down a bit, but we were making out way and finally the common and traveling the shortest distance we could to get to our destination. As part of our team was up the hill a bunch of us were killed and had to be buddy carried up the hill. Finally in a pack we start to form back into formation and Cadre Chris says the words that after 12.5 hours we weren’t sure when we were going to hear them “Congratulations you are finished” as we formed into our last formation as GORUCK Class #453 Team Bravo to receive our GORUCK TOUGH patches you could feel the energy from everyone it was amazing. We had finished, hugs all around from 30 people that some may have known each other but in that 12.5 hours of Good Livin’ came together as a team to complete an event that some would just say is plain crazy. But as I look at it now, it was a challenge that I could have not done without everyone that was there and I am extremely grateful to have gone through the challenge to learn about myself but to learn about what others can do when you work as a team. I look forward to doing more events with the NE Spahtens in the future as I have learned being part of a team is better than going at it alone. When I was asked Saturday evening if I would ever do one again, I said no way. But when I woke up Sunday and realized what we had accomplished, I cannot wait to sign up and finish the next one.